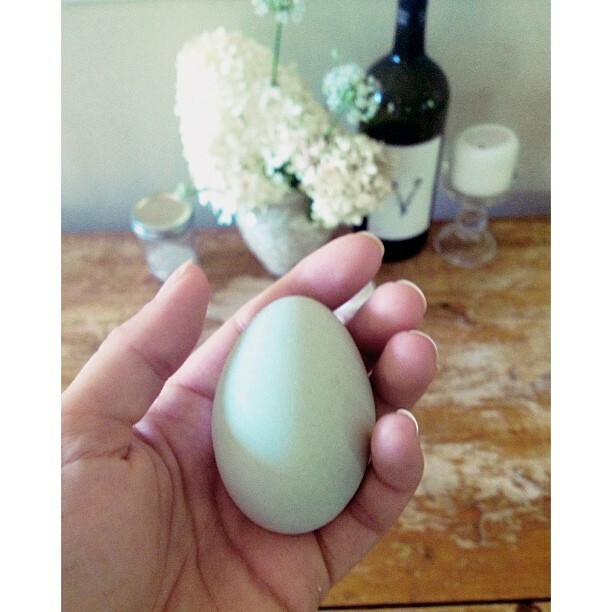 Among the more exciting aspects of moving to our farm last spring was the prospect of having our own blue eggs. At least for Eileen it was. She was obsessed with the Araucana breed of chicken that is known to lay beautiful, pastel blue eggs. Within the first week of moving to Little Seed Farm we were on the hunt for local breeders that had an Araucana laying hen. It’s quite easy to find young chicks that six months later will grow into adult laying hens and lay their first egg, but six months seemed like a lifetime to wait. We needed an actively laying bird, and we needed one now. After much hunting, we found a farm about an hour and a half away that had ONE left. Despite not yet having unpacked 99% of our boxes, or really done much in the way of preparing for our first chickens, we were off to the races. Our new blue egg layer would need some friends, and we also wanted to pick up a few guineas to help control the abundant tick population upon whose turf we had encroached, so we loaded up our dog crate in the Subaru and head out to get us some birds. To say this lady’s poultry farm was a bit “redneck” would be an understatement, but hey, she had the blue egg layer we needed and a few guinea hens to boot. We picked out the birds we wanted and off her son and daughter went with a huge net to hunt them down. Once they were bagged, we headed home to the sound of guineas screeching, a sound we would become all too familiar with over the ensuing months. When we arrived home we unleashed the birds into their coop area and watched them attentively for an absurd amount of time. I love thinking about those days when we got our first animals. It was like being a kid again. Such awe and amazement. I think we half-expected the Aracauna to plop out a blue egg right in front of our faces, but she didn’t, so we waited. We waited, and we waited. As a matter of fact, we’re still waiting. That’s right. A year and a half later she has yet to produce a SINGLE egg. Heck, I’d be happy with a white egg at this point. We knew she was a bust after a few months, but by that point we already had a big enough chicken flock to keep us in eggs and we were so busy with the goats, pigs, cows, etc than spending a day or two hunting down a singular Araucana just wasn’t in the cards. Blue eggs would have to wait. And then came our opportunity. A few months ago we were looking to expand our egg laying flock and we had some friends hoping to unload a few of their chickens. These chickens happened to be of the blue egg laying variety. They only wanted to give up one blue egg layer, but that was fine with us. I brought her home and put her with the other layers and we waited. We waited, and waited. And then she laid a brown egg. Dang it! At this point it was pretty hilarious and we resigned ourselves to a life without blue eggs. But escape the blue eggs we could not. Another friend had a handful of “Easter Eggers” he was looking to sell. He claimed that some would lay blue, some would lay beige, and so if we bought 5 or 6 we’d be certain to get at least one blue egg layer. Then on one fateful morning, after waiting for a glorious blue egg to appear in the nesting boxes, it did. Eileen had her blue egg, finally. This is our first blog post since the new site was launched, so if this is your first time visiting, we hope you enjoy it. Instead of landing on the "blog" page, we now have a static landing page with a little info about the farm and links to all of the various pages. The business went through a little growth spurt over the past few months and not only have we been hard-pressed for time to write blog posts, but we also felt that updating the site to focus on aspects other than the blog was appropriate. Hope you like it! And now back to our regularly scheduled blogging. The Cotton Trailer Saga. Last weekend I had the opportunity to get a cotton trailer, which is something I've been wanting for quite some time. Cotton trailers vary in size, but the most common is about 30' long and completely enclosed by a metal cage. They make a perfect portable chicken coop and goat shelter combo at a highly affordable price. With our herd growing from just a few goats last year to 20+ this year and 40+ next year, we need to think about scaling up our shelter situation. We also want to raise more laying hens, so cotton trailers really fit the bill. The problem is that cotton trailers were used a very long time ago and are almost certainly in complete disrepair. Therefore, if it wasn't within 50-75 miles driving distance I wasn't going to bother with it. I didn't want the responsibility of hauling a cotton trailer on a major highway. So when one became available in our area I jumped on it. An acquaintance of ours had four of them sitting on his property and for the past year had refused to sell me one. Then one day he capitulated. Upon arriving at his farm we saw the cotton trailer and the expected rough shape it was in. The dual axles on the back hosted only two tires instead of the four that it should have had. Not only that, but they were on different axles! None of the tires matched and there was an old fridge laying in the middle of the floor. We all agreed that it would "probably" make the ride down Rt 231 without a problem. Once it was on the farm we wouldn't have to worry about it. It just needed to make it home. And, of course, about 15 miles from home... "boom"!... a flat. Not just a flat, but a completely dented and destroyed rim. Luckily the trailer kept on rolling and didn't flip or do anything crazy. I pulled it over slowly into a neighborhood and pulled off to the side of the road. Upon inspecting the rim I realized it took six lug nuts instead of the typical five and that the spare tire on the truck wouldn't fit. At 6pm on Sunday there's not much I could do... nothing is open on Sundays around here. So I called our friend and trusty neighbor who is on speed-dial at all times. He picked up the phone, heard out my story and went around to check all his equipment for tires with six lug nuts. Hoorah! His goose-neck trailer had six and he pulled one off and drove it my way. We jacked up the old cotton trailer and went to fit the spare tire. But what to do with the cotton trailer in the meantime? Here I am in suburbia, BMW's and fancy SUVs parked up and down the block and I've got a broken down cotton trailer parked on the side of the road. Not only that, but everyone that drove by for the past hour just turned their head, aghast at such a sight. Just when I lost faith, however, a nice fellow pulled up and asked if we needed help. We told him we just needed a place to put the thing until the next day. He pointed out which houses were most likely to sacrifice their beautiful lawns to potential cotton trailer destruction and we went about ringing door-bells. Luckily, the first house we approached said yes and was very understanding. So there it sat. In the morning I called around everywhere and no one had anything in inventory. The Farmer's Co-op said they might be able to match it, but not guaranteed. We took the wheel over and they rolled it back to match it up. The Co-op employee came back a few minutes later and said they didn't have anything for us. Damn. As we headed back to the truck another guy came out from the back and said he found something that might work. Excellent! Sure enough it would fit and we put a tire on the new wheel and we were off to the races. Once upon a time we had only 4 chickens. One was our rooster, Elvis, and the other three were our laying hens, Sassy, Wynonna, and Freja. Freja, (the special green egg laying chicken - purchased especially for this quality) doesn't lay, so really, only two of our 4 chickens actually produce eggs. During the summer and fall, this was fine and we had all of the eggs we needed. Then winter came and, well, lets just say we were lucky to get 2 eggs a week! As Scrapple recounted last week, this egg shortage is no longer an issue and now, instead of rationing our eggs, we find ourselves with the fortunate challenge of trying to find various ways to use all 5 dozen a week up! Occasionally, that scene from Napoleon Dynamite comes to mind... You know, the one where the farmer has "lunch" set out for the handful of kids who worked the chickens that day? Egg salad sandwiches, hardboiled eggs, and raw egg sludge by the ladleful. Mmmm. Nono - no worries of that around here! We've found some tasty ways to use them up, one of my favorites is this custardy oven pancake.